According to Greg Chaney, owner of J. C. Building Maintenance, a siding contractor based in McCutchenville, Ohio, "High-quality siding materials possess a wide variety of special features, including intricate trim work, which drives up the markup." He notes that a high-quality vinyl siding material may be marked up 15 to 20 percent, whereas a lower-quality product such as a simple aluminum siding would only be marked up about 5 percent. Inexpensive siding, such as thinner products of less than .035-inches in basic colors like white, usually initiate a low markup of around 5 percent, while higher-priced products, like siding .040-inches thick or more, result in markups in the 10 to 15 percent range, says Chaney. The work required to install your siding also greatly affects the markup. Chaney explains: "For instance, if I were to put siding on a house that previously had slate, and I had to remove and dispose of the slate and then install the siding, the markup would be 10 to 20 percent, whereas there would probably not be a markup if I took off and replaced aluminum siding that I could recycle." Higher quality products that require more intensive and skilled workmanship for installation also drive up the markup. And the size of a building can affect the labor involved and siding prices, as well. Two-story houses, for example, can involve a higher markup than one-story structures. 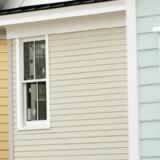 During your siding selection process, a reputable contractor typically offers you various options in terms of markup. "The contractor should give you a variety of siding scenarios--from those on the lower end of the price range to the higher end," advises Chaney. "The contractor should also be able to explain the markups associated with the various products in a way that enables you to make an informed decision."